Of Mount Kilimanjaro’s seven official trekking routes, Machame is thought to be the most scenic and therefore the most popular. It can be done in six or seven days. The Rongai is considered the easiest and uses different ascent and descent routes for added variety. The Marangu is another easier route but it tends to be busy, uses the same ascent and descent routes, with accommodation in shared huts with other climbers. 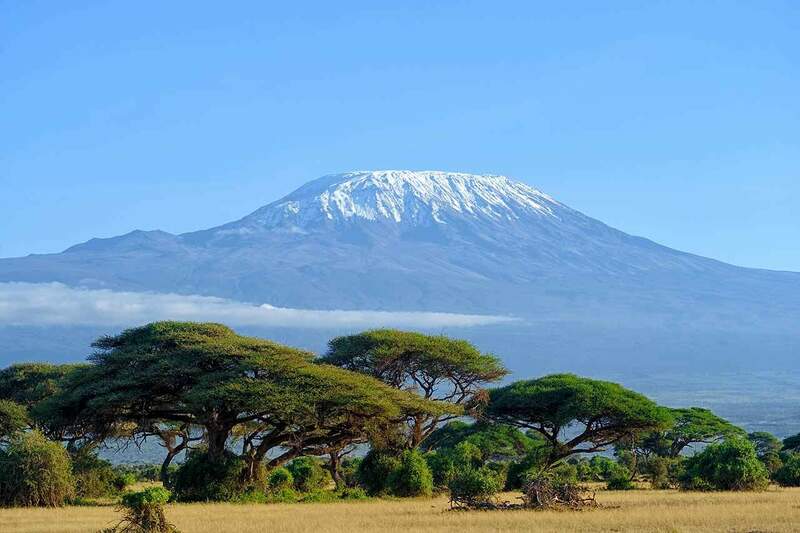 It is no longer possible to make the climb Kilimanjaro independently as all trekkers need to be accompanied by a registered guide and pay entrance park fees. We recommend that you book with a reputable UK-based tour company who will be able to provide all travel arrangements, camping equipment and a full support team. If you are planning to trek to the summit of Kilimanjaro you need to ensure that you have a good level of fitness and are properly equipped. While the climb is not as challenging as the high peaks of the Himalayas or Andes, high altitude, low temperatures, and high winds make this a difficult and potentially dangerous trek. Altitude sickness is the commonest reason for those failing to reach the summit, Uhuru Peak, and can strike even the most experienced of trekkers, so it is essential that you plan to allow a minimum of five nights for the climb allowing you to slowly increase your acclimatisation time. Malaria is not a risk while you are on the mountain as there are no mosquitoes above 1,800m, but you are at risk before and after your climb so we recommend you take anti-malarial medication in advance of your travel. You will need a yellow fever vaccination before travelling to Tanzania. Optimum climbing conditions occur between December and February, and from July to September. The busiest season on the mountain coincides with summer holiday period in Europe and N. America. April, May and November are the wettest months and so not ideal for trekking. December is becoming a popular month, despite being very cold on the summit. Snow cover on the mountain is highest between November and May. Big Cat Travel Insurance’s Extreme Activity Pack covers any altitude above 4,500 metres, and is suited to the most challenging of mountain treks such as Kilimanjaro, (nearly 6,000 metres at its summit), Aconcagua, and Mont Blanc.